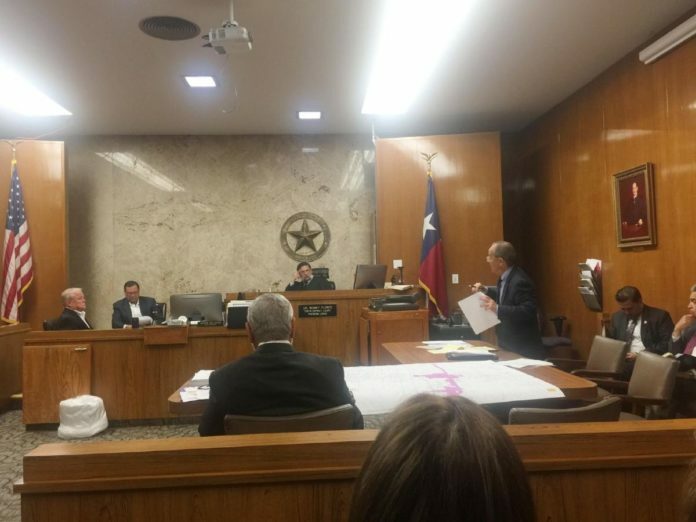 A hearing was held Tuesday morning before visiting judge J. Manuel Banales in Edinburg on a lawsuit filed by Donna mayoral candidate Ernesto Lugo against the city and Hidalgo County Elections Department. Ernesto Lugo suspended his mayoral campaign Tuesday after a state district judge did not find enough evidence to support his contention that he resides within the Donna city limits. Lugo had filed a lawsuit against City Secretary Laura Balderrama and Hidalgo County Elections Administrator Yvonne Ramon on Friday. He asked the judge to issue a temporary injunction that would stop the city from preventing him from becoming mayor, if elected. Much of the testimony surrounded a development agreement signed by Lugo’s mother and father in December 2016. City officials have repeatedly cited the agreement as the reason for the declaration of ineligibility. The agreement, according to a letter sent to Lugo by Balderrama, prevented the city from annexing the property for 15 years. Balderrama informed Lugo of the ineligibility on Oct. 12, a day after the city received a complaint about his residency and eligibility for the office. Balderrama testified that she, along with the city attorney and city manager, evaluated the allegations presented in the complaint. An Hidalgo County Appraisal District printout of the entire Lott Road property, a publicly available document, was attached to the development agreement. Lugo remained adamant that the signed development agreement did not exclude the entire Lott Road property from within city limits, just a portion of it. He previously accused the city of attaching a document that differed from the one his parents were originally given. Ramon testified that prior to October the department had not received a copy of the development agreement. It wasn’t until Oct. 20 that Balderrama reached the county elections department to revise a map previously approved by the city. The prior map showed Lugo within city limits. Lugo filed for candidacy in August. Two months later, Lugo received a letter signed by Balderrama that said he was ineligible to become mayor because of the development agreement. “It’s unfortunate it took us that long to figure it out, but it is what it is,” J. Arnold Aguilar, who represented the city, said during closing statements. Aguilar requested that the decision about eligibility be held off until after the election. “We would like the court to make a decision,” Ruben Peña, Lugo’s attorney, said in closing statements. The judge, concerned about voters, made the move to dissolve the temporary restraining order. He used a high school football analogy to describe the eligibility matter. If an ineligible star quarterback plays on the team, District Judge J. Manuel Bañales explained, games will be forfeited. Bañales was initially concerned about the allegations presented in the lawsuit. “The judge found that Mr. Lugo failed to establish residency within the city,” Aguilar said following the hearing. “We’re not happy with it, but it is what it is,” Lugo said of the decision following the hearing. With the discontinuation of the restraining order, Lugo will not be able to vote in the municipal election. Lugo’s name remains on the ballot along with mayoral candidates Simon Sauceda, Rick Morales and incumbent Irene Muñoz.